« Congrats to NOVA students!!! NOVA is participating with the development of the Virginia Cyber Range. The Range will expand cybersecurity competitions for Virginia cyber students, and will also host exercises and labs. The Commonwealth of Virginia is taking an important step to develop the workforce needed to keep data and systems safe from cyber threats. Working with eight other public institutions of higher education across Virginia, Virginia Tech is leading an effort to create a state-of-the-art platform for cybersecurity education. The Virginia Cyber Range will provide advanced cybersecurity training exercises for high-school and college students, revolutionize cybersecurity education within the commonwealth, and position Virginia to become a leading source of critical cybersecurity expertise for the nation. 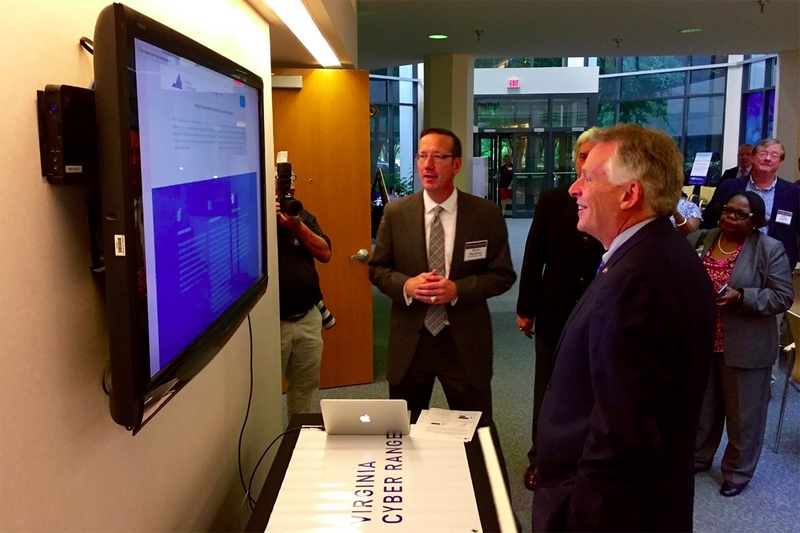 The Virginia Cyber Range will work to produce more well-prepared graduates to enter the cybersecurity workforce. The project’s initial focus will be on serving community colleges and four-year institutions with offerings that will include modules for use in college courses, laboratory exercises and projects, and realistic tactical cybersecurity trials that can supplement existing courses. Students will gain knowledge of digital forensics, network defense, how to secure critical infrastructure and the “internet of things,” malware detection, usability and privacy issues, and secure coding practices. The project is expected to evolve to also serve K-12 students and other groups within the commonwealth. The Cyber Range will largely operate as a virtual center. Offerings will be crafted and hosted in the “cloud,” where they can be accessed by participating schools and agencies. This approach will allow for easy customization, scalability, and responsiveness, while minimizing costs. The Virginia Cyber Range brings together faculty from George Mason University, James Madison University, Longwood University, Norfolk State University, Virginia Tech, and Radford University, as well as faculty from Lord Fairfax Community College, Northern Virginia Community College, and Tidewater Community College. These institutions were selected based on their federal designation as centers of academic excellence in cybersecurity or digital forensics. Virginia Cyber Range Director David Raymond said, “We are excited to build an innovative, statewide resource that will be a game-changer for cybersecurity education across the commonwealth. I am honored to work with the partner institutions to chart the way forward for this important project.” Virginia Tech’s IT Security Office is coordinating the development and use of the range platform. “It is exciting to see the Virginia Cyber Centers of Excellence come together to create a hands-on cyber training environment that will enable students across the commonwealth to obtain the skills they need to move directly into the workforce,” said Karen Jackson, Virginia’s secretary of technology. A demonstration of cyber-range capabilities was provided at the Virginia Cyber Physical Systems Summit. The Virginia Cyber Range will offer a limited number of classes beginning in January 2017.